Birthday Candle or Sage on Fire? North Abraxas never stops surprising me! I could go again and again and each time, something will happen that will leave me laughing and thinking that I need to put this in my blog! All things considered, I went to have dinner with my cousin for her fabulous birthday. We got a seat outside right next to the entrance of the restaurant and we could clearly hear the loud and funky music from the inside. It made us a bit jealous of all the people sitting there by the bar. I ordered the beef carpaccio as a yummy starter and do not regret trying it out for the first time! The meat was tender, the spices were the best choice to put on. Everything about this dish was really was amazing. Next up, we ordered the Jericho green beans, something that is impossible not to order when eating here. The black pepper pizza came right after as well, another must at this spot! Furthermore, my cousin and I then wanted to have the warm spinach topped with parmesan and it was everything we needed! The spinach was perfectly cooked and tasted divine and fresh. The parmesan was really the perfect topping to put on for a fun taste! Now, we’re eating and talking. And everyone started dancing, getting up and cheering inside by the bar. My cousin and I both looked at each other confused. Then, all the chefs came to every table to give free focaccia they prepared. Not to mention that we ordered a piece too. Once again, it was perfect! The bread was crunchy, the cheese was melting and the tomatoes were fresh and cut into small pieces. After the meal, I asked for a chocolate cake and a candle for my cousin’s birthday. And obviously, the candle here isn’t exactly the candle we are all used to… right? 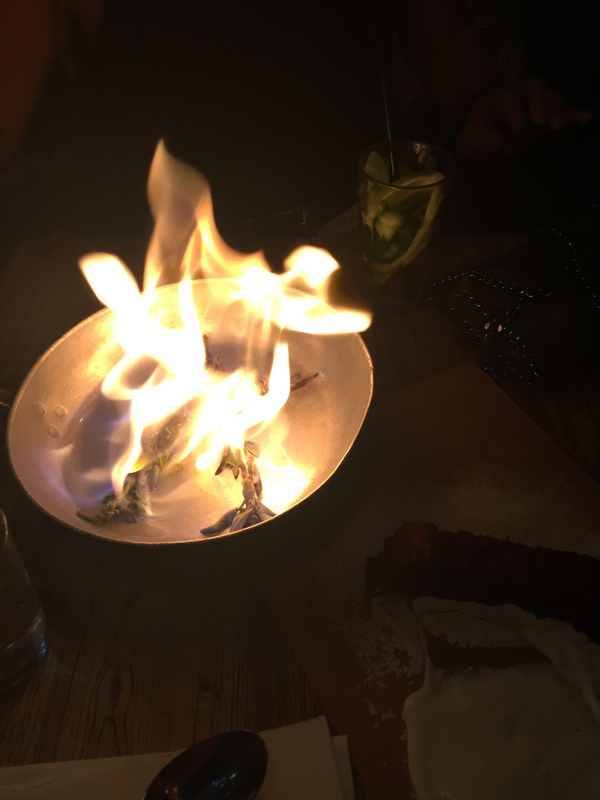 The waitress came with a big pan with sage in it, alcohol and put it on our table and lit it up on fire! Seems like the most unique candle right guys? It was already 30 degrees outside and we had a heater right in front of our faces, we laughed that we were melting right on the spot as we were waiting for the fire to turn off. After five minutes, we digged into the chocolate cake, which was the perfect desert for our dinner. Thank you for the lovely dinner! What is your favorite at this restaurant? Previous Previous post: Hitting the Gordon Beach! Next Next post: It’s Better in the Bahamas! How did the sage handle smell? I love sage! I have a couple sticks I burn. Smelled too good! Yes i do that too at home! Do you have a spam problem on this site; I also am a blogger, and I was curious about your situation; many of us have created some nice practices and we are looking to exchange techniques with other folks, please shoot me an e-mail if interested.